The 34.14 metre motor yacht Bess Times has been listed for sale by Bob Cury at RJC Yacht Sales. Built in GRP by US yard Westport to a design by Jack Sarin, Bess Times was delivered in 1999 as a Westport 112’ raised pilothouse model and refitted in 2014. Accommodation is for eight guests in four cabins comprising a master suite, VIP suite, double and twin. All guest cabins have entertainment centres, Sony LED television screens and en suite bathroom facilities while the crew quarters sleep four staff aboard this yacht for sale. 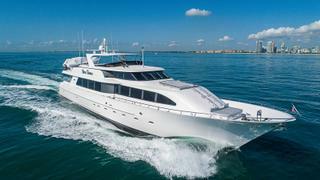 She features a 24' beam with a full-width saloon and forward dining area providing a feeling of increased spaciousness. The interior is tastefully done with marble surfaces complementing the oak wood tones throughout the yacht. To port is a marble topped sunken bar with four bar stools, icemaker and sink with storage areas. To starboard is a large L-shaped sofa with two ottomans. The entertainment centre includes a Samsung 42-inch HD television screen on a lift that drops down when not in use and a new Sonos stereo surround sound system. Forward is a formal dining area with a large, round glass-topped dining table and eight upholstered dining chairs. A notable feature is a custom overhead soffit with a decorative light fixture and dimmable recessed lighting over the table. To port and starboard are built-in buffet cabinets with marble surfaces and custom storage below for china, glassware and cutlery. Outdoor entertainment is certainly not neglected, as the flybridge offers comfortable upholstered seating for al fresco dining, a Jacuzzi spa tub, full wet bar and a barbecue, all protected by a rigid Bimini top. Twin 1,800hp MTU diesel engines allow a cruising speed of 19 knots topping out at 24 knots. Lying in Miami, Florida, Bess Times is asking $2,995,000.